So my blog is filled with gadgets, some might think they are gratuitous, but for the few that salivate at every new post, well, this next product is for you, er, when you have left this gadget filled world. 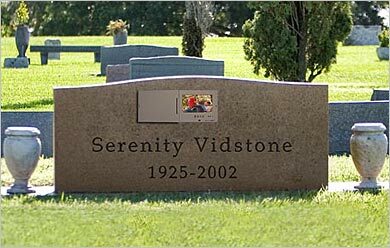 The VIDSTONE Serenity Panel is a 7″ LCD Panel that can be attached to almost any upright or slanted gravesite monument, including gravestones, mausoleums and columbariums. The panel can store up to a 5-8 minute photo slideshow — your prized PEZ collection would look great! The unit is solar powered and weatherproof, so you (your family) don’t really have to maintain it, other than replacing it after about 15 years, clearly, nothing good lasts forever. So start saving up, this unit only costs $1500 (cheaper than most products featured on Mavromatic), then you have the rest of your great life to create the content for the panel.